On the last afternoon of 2016, as I continue the clean up of my studio and office, I come upon a small pack of Bruyneel-Sakura coloured pencils, likely from an Urban Sketchers symposium goodie bag. Seems fitting to end the sketching year by drawing Alice once again. Happy new year to all my sketching friends. Hope to draw with many of you in 2017! There was quite a good snowfall in Montreal yesterday, and for once it’s not followed by rain or freezing rain. That’s makes it pretty perfect to paint. After a good storm like this, there’s snow on the vertical surfaces like trees and poles but it doesn’t last long so I went out early. Fortunately the plows had already passed in Pointe Claire. There’s nothing worse like being pushed out of a parking spot by a snowplow driver honking in back of you when you’re in the middle of a sketch. For a quiet scene like this I stick with lighter colours — mostly Cerulean Blue, Organic Vermilion and Hansa Yellow. 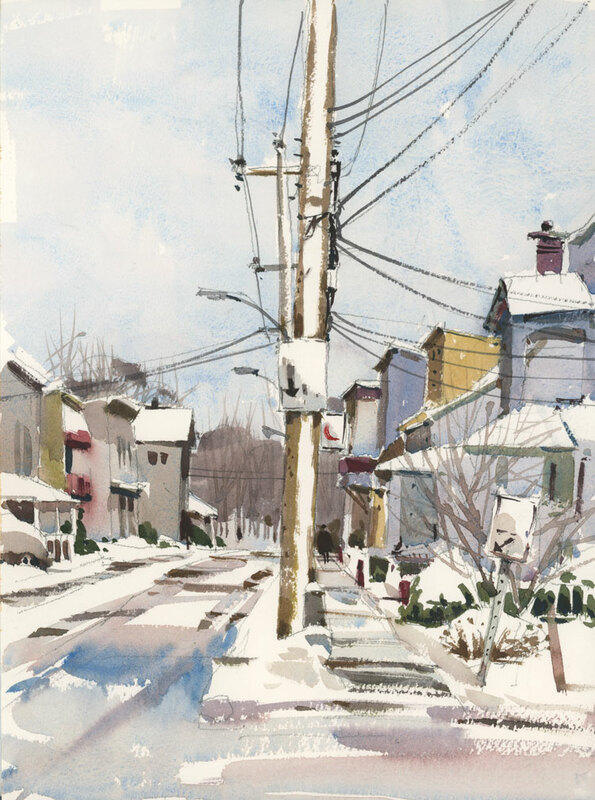 I am able to get all the soft tones I like with this triad, but for the wires and evergreens I have to boost it up a little with some darker pigments. 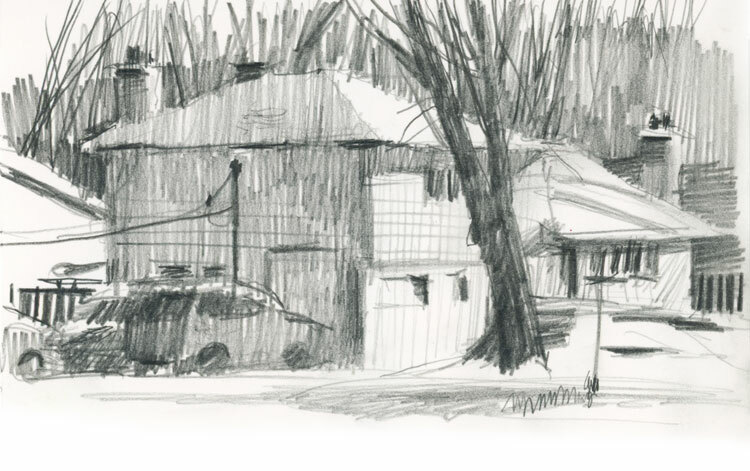 Sketched on Arches CP paper, 9″ x 12″ in a cold car with foggy windows. Winter requires a limited palette. I don’t usually carry Raw and Burnt Umber in my kit, but added a bit today to paint the tree scene in the cemetery. Even though you had to look hard to see colour in the cloudy landscape this morning, when the sun came out everything changed. 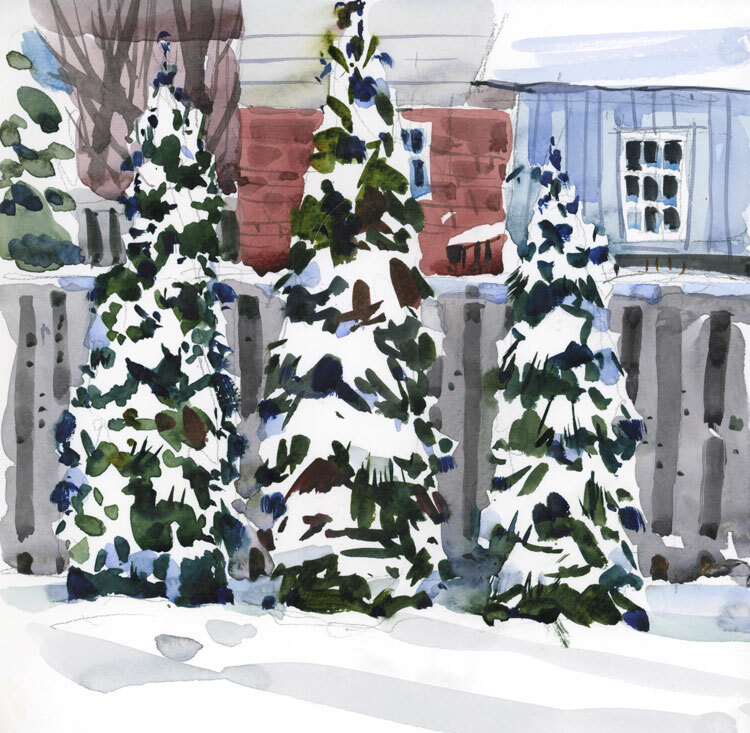 The contrast in values between the trees and the snow became sharp, and suddenly there was movement and direction. Today was also a good day to use the Indanthrene Blue that sits in a corner of my palette. Mixed with the Burnt Umber and some Alizarin it makes a great dark for the trunks and branches. Painted on Arches Rough Paper, 10″ x 14″. It’s studio clean up day for me, which always involves looking through piles of filled sketchbooks (it’s a form of procrastination, no doubt). It’s sort of a review of the year too, and also a way to find if there are any unused pages I can fill. 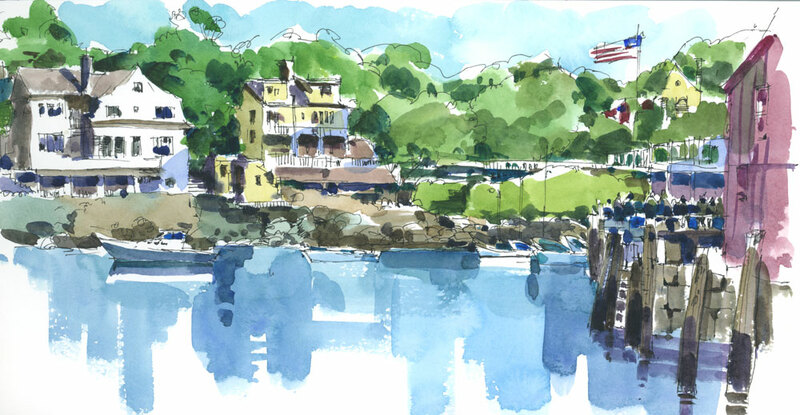 Sometimes I also find sketches I haven’t scanned, like these two from Rockport, Mass. It’s funny, the things that come back to you when you look at the sketches. With these, it was the wind. I painted the first one (with all the boats) on the cold side of Tuna Wharf. It’s the side that faces the open water, just at the start of the channel where the fishing boats go out to sea. I seem to always choose the worst time to paint there, at the end of the day when the wind picks up. I can see from the shaky squiggles that I made on the page that I was really cold. My brush strokes are messy and not very precise. 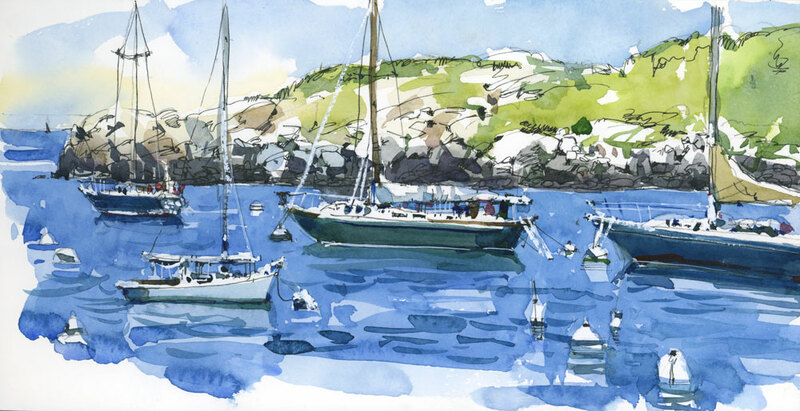 The second sketch is done from the protected side of Tuna Wharf, sitting in the sun, at the end of the day. 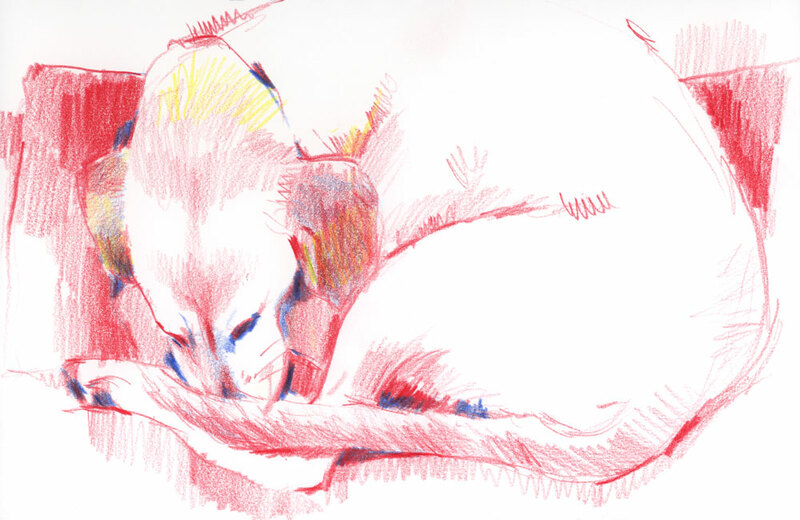 When I look at this one, I can feel reflected heat from the wall behind me, and the more confident lines in the sketch are revealing — this was certainly a more comfortable place to draw from. Ok, back to the big clean up. For the very quickest of sketches, I’ve been keeping a pencil and a really small sketchbook in my bag. If you want to make drawing a daily habit, then the book needs to be with you wherever you go — for those waiting times in the dentist’s office, for the commute home on the train or bus, or even for a few minutes on your lunch hour. And it doesn’t need to be something significant that you sketch. Maybe it’s just the way the light hits the house across the way, or the big boots on the guy sitting next to you on the bus, or the half empty coffee cup on your desk. Every little bit of drawing practice is valuable, and the easier it is to use the tools, the more likely you will be to do it. I’m not big on New Year’s resolutions, but if there’s one I’ll try to adhere to this year, it’ll be to take out the book in the bag a little more often.